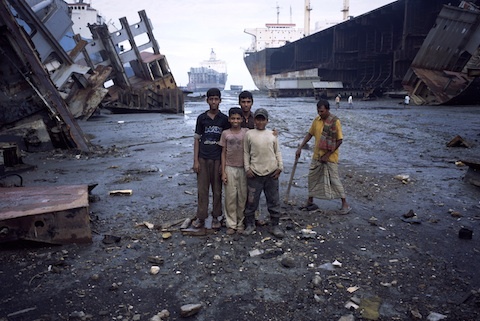 Asbestos is a common hazard in ship wrecking which is commonly performed without adequate controls in Bangladesh, India, and other developing countries. Asbestos is a set of several naturally occurring minerals that are used in a wide range of industrial and commercial applications, including building materials and vehicle brakes. Airborne asbestos settles in the lungs and can cause serious lung diseases including asbestosis, lung cancer, or mesothelioma years after initial exposure. Asbestos is still commonly used in numerous industries throughout the developing world in construction materials, automotive friction products, and insulation. According to the World Health Organization, approximately 125 million people worldwide are exposed to asbestos in the workplace. Asbestos is responsible for approximately half of the deaths from occupational cancers. Approximately 90,000 people per year die from asbestos related cancers. Reducing worker exposure to respirable asbestos fibers would have a dramatic effect in reducing several types of life-threatening diseases, including lung cancer. Even if the mining of asbestos and the production of asbestos-containing products were completely eliminated, occupational and environmental exposures would continue into the future due asbestos in products that continue to be used. Existing asbestos-containing building materials including insulation, roofing, and flooring create significant exposure risks when damaged or disturbed during renovations or building demolition. Asbestos-cement is a growing industry – especially for corrugated roofing used throughout the developing world. In India the asbestos cement industry is growing at around 10-12 percent a year. Eighteen large companies dominate the market and employ approximately 300,000 people and constitute a $669 million dollar (US) industry. In Indonesia, 97% of asbestos imports are going into asbestos-cement roofing (see video). Against this backdrop an article published online in June 2016 in the Journal of Occupational and Environmental Hygiene (JOEH) defended the use of these products by claiming that they are “not expected to release appreciable amounts of airborne asbestos fibers.” The article “Airborne asbestos exposures associated with the installation and removal of roofing products”, by Lotter et.al. misrepresented the data from other published studies and was retracted by the Journal. OK International, Kathleen Ruff (Righton Canada), and a group of other scientists in the field, were initially successful at persuading JOEH to retract the article although later it had been removed from the Journal’s website and listed as “withdrawn”. Others have also pointed out the serious improprieties in the publication of the article, including the undisclosed conflict of interest on the part of the column editor who approved the article for publication and the lack of any peer review (see http://www.rightoncanada.ca/?p=3768). Our letter requesting the Journal to retract the article outlines where the authors manipulated the data to reach false conclusions. The article directly contradicts evidence in the literature cited in making misleading statements including “The findings indicate that short-term and full-shift exposures from the use of asbestos-containing roofing products were typically well below applicable occupational exposure limits.” In fact the record clearly indicates that the majority of airborne exposures during the removal of A/C roofing exceed the current U.S. OSHA 8-hr Time-weighted average Permissible Exposure Limit (PEL) of 0.1 f/cc. In order to minimize harmful exposures and prevent asbestos related disease throughout the developing world, OK International supports the need for an international ban on the mining and use of asbestos worldwide. While some countries including the U.S. have national laws and programs to restrict the use of asbestos, some products including brake linings continue to be used.